Computational Mechanics studies reveal many of the key underlying aspects of these systems and can establish important design criteria concerning device failure. For example, results are used to indicate the maximum strain or stress in a system, or the critical strain for buckling, etc. 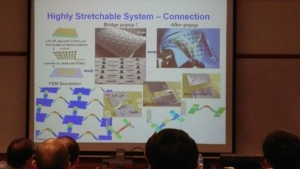 Furthermore, studies are made to optimize mechanics and materials for circuits that exhibit maximum stretchability. 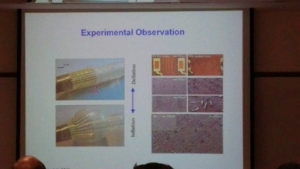 In this talk, Dr. Liu shared how in the current study, numerical simulations are used for investigations of materials and system designs for flexible electronics devices, which have excellent mechanical flexibility and make them attractive as wearable devices. The new designs are possible to build high performance circuits that are not only bendable but are also, in some cases, reversibly stretchable, with elastic responses to compressive and tensile strains of near to 100% or more. 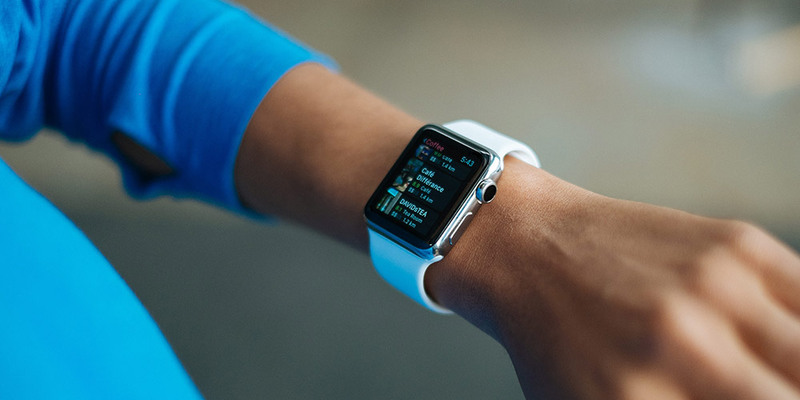 In addition, the application of computational mechanics is a path to build high performance silicon complementary metal oxide semiconductors central to consumer electronics. 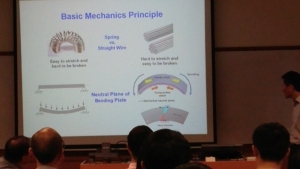 Dr. Liu also shed light on the mechanical designs that remove any significant dependence of these properties on strains associated with bending, folding, draping and other modes of deformation. 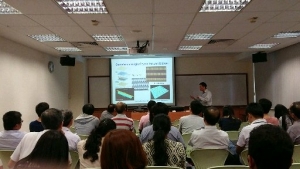 The talked ended with open floor discussion with the conclusion that computational studies are central to discovering the essential features of the materials and mechanics aspects that underlie the behaviour of flexible electronic systems. Dr. Zhuangjian Liu works as a Senior Scientist in the Engineering Mechanics Department, at the Institute of High Performance Computing, A*STAR, Singapore. He received his Ph.D. and M.Eng. degrees respectively from the National University of Singapore (NUS) in 2009 and 2001. Before that in China, Dr. Liu obtained his M.Eng. degree in 1994 from Tongji University in Shanghai and a B.S. degree in 1984 from Tianjin University in Tianjin. Dr. Liu has broad interests in many branches of Engineering Science and focuses on establishing mechanics models for advanced technology. His research areas include solid mechanics, computational solid mechanics, damage mechanics, micro electro mechanical systems, structural dynamic analysis, etc. 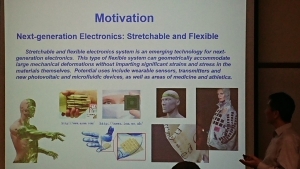 His main research activity nowadays pertains to stretchable and flexible electronics, inorganic solar cells, LEDs, cardiac and neural electro-physiological sensors, multifunctional catheters, epidermal electronics, transient electronics mechanics, and also thermal analysis to evaluate and improve product design using virtual simulation supported by high performance computing. Currently, his research work focuses on computational nanoelectronics and nanomechanics, including instability and buckling analysis to provide scientific and engineering foundations and design guidelines for stretchable and flexible devices. Dr. Liu has co/authored more than 50 journal papers, in multi-disciplinary journals including, Science, Nature and its related journals Nature Materials and Nature Neuroscience; and journals in physics (e.g., APL), materials (e.g., Advanced Materials), nanotechnology (e.g., Nano Letters) and papers in mechanics’ field.